Tenakee inlet is a hidden gem in the whale watching world. Humpback whales frequently pass by the town and can be observed bubble feeding while eating dinner on our deck. We have several platforms to see the whales on the water. The 35 foot Camille is whale friendly boat many times it seems like the whales and other marine mammals are attracted to it. Our smaller boat the fishing bear is faster and gets right to where they are at any time. The last option is our kayaks a real close and personal experience. Orcas are also frequently seen. They travel in different size pods from groups of six to seventy five and will be in the inlet for several hours at a time. 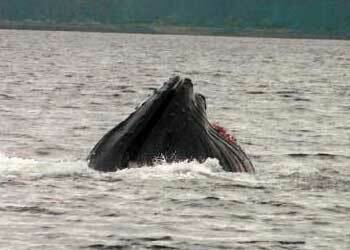 One of the things about the Tenakee Inlet is that it draws some of the largest bubble-feeding groups of humpback whales in Southeast Alaska. Humpback groups of 6 to 15 come to feed in the Tenakee Inlet sanctuary, where the food is rich and plentiful. It is the last stop before making the long trip to Hawaii. They can be observed bubble-feeding between June and September with the most activity in August and September. Whales are observed with frequency during the entire summer (fishing season). Whales are often seen breaching and spy hopping. Breaching is where the whales come out of the water so you can see them. Spy hopping is where the whales come up higher out of the water and turn to gain a better view of what is above water before returning to their watery home. There are two distinct groups of Orcas frequent the inlet: mammal eaters and salmon eaters. Orcas always fall into one or the other group. Some families (pods) of orcas eat only marine mammals and others eat only fish and primarily salmon.